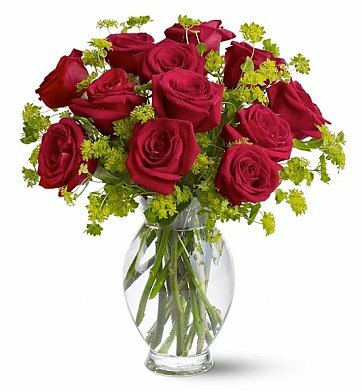 Send this stunning bouquet of radiant roses when you want to make someone feel truly special. Elegantly presented in a glass with contrasting green bupleurum, these lush, lovely 40 cm roses are more irresistible than ever. With their timeless beauty and rich symbolism, the roses make a classic gift of love, congratulations, or affection. 12 Red Roses (40 cm). Measures approximately 14" x 12". Dozen Sweet Roses is a hand delivered gift. These gifts are delivered by one of our local design centers located throughout the United States and Canada. Same day delivery is available for most gifts when ordered before the cutoff time. The cutoff time for Dozen Sweet Roses is 2 PM in the recipient's time zone. Beautiful arrangement! I would highly recommend this company! The pictures don't do any justice! The flowers and balloons I bought were beautiful, delivered on time and made her day! The arrangement has great presentation and the flowers lasted a long time. The roses were first quality and lasted over one week. The roses are dead but still look good. a card with the roses, which I forgot to included with the order.